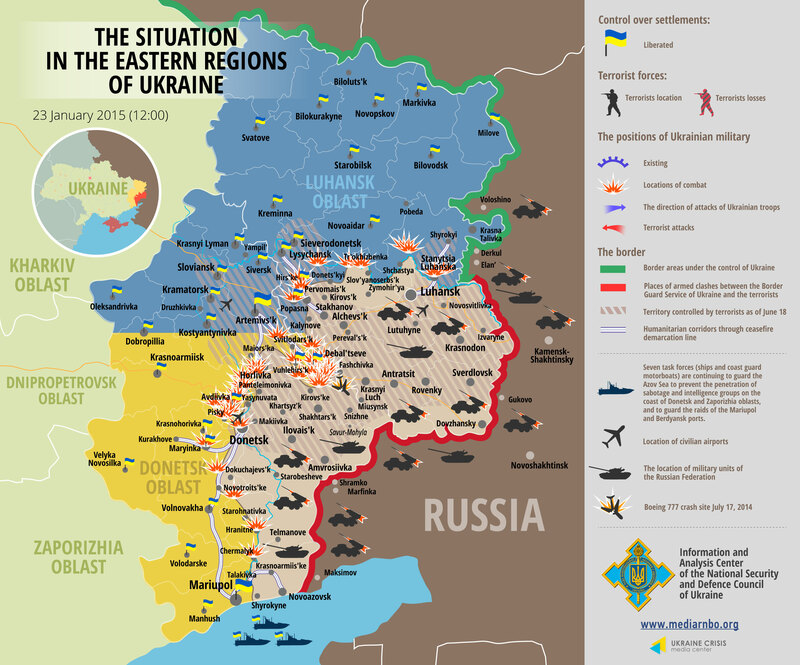 Eastern Ukraine: Whither the latest Russian/pro-Russian offensive? It is now clear that a major separatist offensive is underway in eastern Ukraine. (Again, by “separatist” I mean the combination of Ukrainian rebels, irregulars from Russia and elsewhere, and Russian regulars fighting on behalf of the DPR and LPR). It also appears that the Ukrainian military is at risk of suffering another major defeat, particularly but not only in the Debaltseve salient (see map below). Moscow has again surged its regular forces in the conflict; it has introduced sophisticated weapons not seen earlier in the conflict zone; and it has provided the separatists with the huge volume of ordinance to put them in position to conduct major offensive operations. The immediate question is what are the military objectives of the current offensive. (The broad political objectives I think are clear – as discussed in earlier posts, it is to prevent a “Polish outcome” in Ukraine.) I can see five possibilities, as follows, from less to more ambitious. Already it is pretty clear that this is the “program minimum” for the separatists. Heavy fighting continues in the western suburbs of Donetsk, the separatists have apparently taken a town to the west of Horlivka today called Kransyi Partyzan, and Debaltseve (pre-war population around 25,000) is being pounded by separatist artillery and MLRS fire. Also today the Russian general in charge of Russia’s contribution to the JCCC, which is headquartered in Debaltseve, announced that Russian personnel on the JCCC were evacuating to Artemivs’k. It also seems clear that a very large force of separatists, including many Russian regulars and armor, is massing in the north and preparing to move further into Ukrainian-held territory. Objective 2. As above, but push further to the north beyond the Debaltseve salient and try to take Artemivs’k (pre-war population around 80,000). This would put the separatists in a position to cut off and destroy Ukrainian forces in the salient, rather than simply trying to drive them out. That would put Ukrainian forces at risk of another Ilovais’k-type disaster. On the other hand, it would mean that the separatists have to take their first defended city should the Ukrainians dig in and try to defend Artemivs’k. That would risk a long and bloody urban battle, unless Ukrainian morale collapses and Ukrainian forces are routed. Objective 3. In conjunction with Objective 1 or 2, cross the Siversky-Donetsk River north of Luhansk and try to take the town of Schastya (pre-war population of around 14,000) and the Luhansk Power Station to its northeast. Again, this would mean dislodging Ukrainian forces from an urbanized area, with the prospect that a lot more violence would be required for it to be successful, with the power station suffering the same fate as the Donetsk airport. It would also mean extending the front line across the river, which would add to the military challenge for the separatists. Objective 4. Try to take back all or most of the area held by the separatists prior to Ukrainian’s early summer offensive (roughly the hatched areas in the Ukrainian-held territories in the map above). This would mean trying to take the cities of Kramators’k (pre-war population around 165,000) and Slovans’k (pre-war population around 120,000, heavily damaged during the fighting last summer). Two important factors here are: (1) the likelihood that the local population is at least as hostile to Kyiv as it is to the separatists, which probably makes the separatists assume they would have civilian support; and (2) taking those two cities would give the separatists a natural barrier along the Seversky-Donetsk Rivers and its tributary, the Kazyonnyi Torets. It might then extend south from there along the Kryvyi Torets south to Donetsk. This objective would be ambitious from a military standpoint, requiring occupation of a lot more territory and even longer front lines. It would also require the separatists to assault more urban areas, including not only Artemivs’k, Kramators’k, and Slovyans’k, but other small cities and towns in the region as well, with all the attendant risks of high military and civilian casualties. Objective 5. Push forward in the south and attempt to establish a land corridor from Russia to Crimea. I continue to think that an unlikely objective of the current offensive given the distances involved and the scale of the military undertaking. Were offensive operations in the south to commence, it could entail a very difficult assault on Mariupul, although the separatists might also simply by-pass Mariupul and continue on to the Crimea, investing the city and cutting it off from Ukraine proper later. My guess is that Objective 2 is the most likely. Two important points in conclusion. First, it makes a big difference which party is defending rather than attacking, particularly if it is defending an urban area and has time to prepare its defensives. The last vigorously defended urban area in the war was Slovyans’k, a relatively small city that the Ukrainian military had to pound extensively for weeks before finally driving the separatists out. The Ukrainians never really began significant assaults on Donetsk, Luhansk, or Horlivka before the Russian-led separatist offensive in the summer drove them back. When they did start to dig in at the Donetsk airport and suburbs, the separatists had to apply a great deal of force for a very long time before retaking the airport and pushing the Ukrainians back in the eastern suburbs. This suggests that if the separatists try to take Artemivs’k, Kramators’k, Slovyans’k, Mariupol, or other significant urban areas from determined Ukrainian defenders, the fighting may get a whole lot worse, and indeed the separatists (including Russian regulars) may eventually find themselves overextended and vulnerable to counterattack. That will be all the more likely if some significant portion of the civilian population ends up supporting the Ukrainians, or at least remains neutral and unwilling to support the separatists. Finally, I continue to be struck (to put it mildly) by how little coverage there is in the Western media of what is now a major interstate war in Europe with huge geopolitical and humanitarian implications.